Let me start this gear review by fessing up to the fact that I’m not the greatest runner. In the past fifteen years, I’ve managed to rack up seven knee surgeries, torn ligaments and the onset of arthritis in both knees — but I still love to run. There’s truly something about starting your morning or ending your day with fresh air and time alone with your thoughts. But as a habitual knee abuser, I spent most of the summer in search of a pair of running shoes that fit my specific needs, i.e. : provides a ton of support and stability, and performs equally as awesome on the dirt and pavement portions of the trails that I’m lucky enough to have right outside of my front door. Enter The North Face Women’s Ultra Cardiac II — a beautifully designed, exceptionally comfortable shoe that makes running (even with bum knees), so much more enjoyable. Pros: Where to start? These shoes are wrapped in some serious technology and sport features for days. 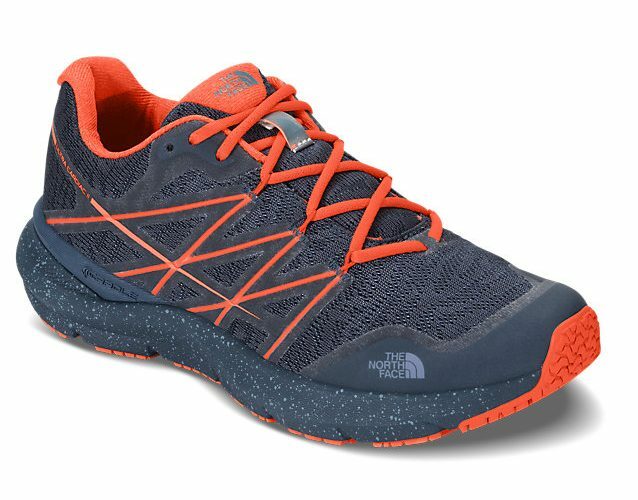 It’s lightweight design (9.1 ounces) makes the Ultra Cardiac IIs an excellent travel shoe to toss in your pack or suitcase to keep your exercise regimen on track on the road, or even to keep your feet nice and comfy on extended walking explorations during your travels, because the comfort level is off of the charts with these shoes. The combination of an Ortholite foam footbed and compression-molded EVA (ethyl vinyl acetate) midsole creates a cushy arch-fitting pillow for your feet that staves off cramps and keeps you on the trail longer. Klutzy runners, like myself, will appreciate the Ultra Cardiac II’s TPU toe cap protection and the grippy Vibram® Megagrip sole which minimizes slippage on loose patches of dirt trails. The shoes also feature CRADLE™ heel-stability technology which creates more stability and support in the heel that ultimately leads to less strain on the ankles and knees, especially when tackling uneven downhill sections of a trail. The shoe and tongue are made with a breathable mesh, which makes these shoes an excellent choice for warm weather runs. My Ultra Cardiac II’s run on the bigger side, but the lacing system easily tightens to the top of the foot and the extra space creates just enough room to wear a thicker cushiony running sock, which ups the comfort level of these shoes even more. Cons: While The North Face does offer a handful of waterproof running shoe options, the Ultra Cardiac II isn’t one of them, which limits these excellent running shoes to dry weather days only. Where We Took It: Running on Colorado paved and dirt trails.